On May 30, at the opening session of the Theologico-pastoral Symposium held until June 1 at the Fatima Shrine, and attended by 340 people, was presented the latest cultural project of the institution: the periodical publication "Fatima XXI - Revista Cultural do Santuário de Fatima", already made known to journalists at the press conference held on May 12. The first issue, with 145 pages, is available for sale at the Shrine of Fatima bookshop for 9 euros per copy ([email protected]). This journal, in Portuguese language, was projected and outlined in the context of the celebration of the 100th anniversary of the Fatima apparitions; it will have a semiannual character and will be available in May and October. In the words of Fr. Carlos Cabecinhas, Rector of the Sanctuary of Fatima, its aim is to be “a journal of cultural nature, which seeks precisely to echo and reflect the cultural dimension of Fatima”, thus joining the other periodic informative projects of the institution”: “Voz de Fátima” [Voice of Fatima], the monthly publication in Portuguese, and the international quarterly bulletin “Fátima Luz e Paz” [Fatima Light and Peace] in seven languages. In addition, this project intends to "be a space for reflection on topics related to the history, culture and message of Fatima, through readings and interpretations that will be multidisciplinary, involving different but complementary perspectives." 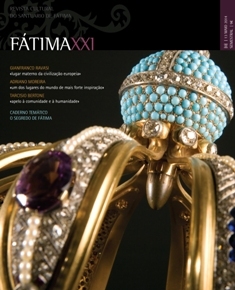 "The Centenary supplies us the favorable occasion for trying new ways that enrich and enhance the reflection about Fatima and propose a renewed language, both in the forms of interpreting and in the patterns of exposing such interpretations”, as we see in this publication, explains the Rector of the Sanctuary, and the Director of the journal as well. According to the assistant director, the pages of the new Journal "intersect and combine different viewpoints and understandings, embracing remarkable ideas of the protagonists of Fatima but, above all, fostering renewed approaches to this inexhaustible subject, read in a polyhedral way." In the pages of the first issue we find yet several flashes related to the Centenary of the Apparitions, and through photography and text is remembered the most special event of the past year: the visit to Rome of the Image of the Little Chapel. All numbers will have a heading entitled "Fragments of History" which, in the first issue, exhibits a very special document: the manuscript of the celebrated "Ave Maria of Fatima", written in 1929 by the poet Afonso Lopes Vieira.